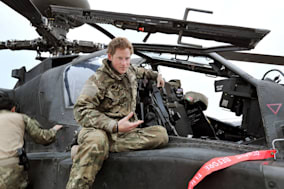 Prince Harry is leaving the high-octane world of the Apache helicopter co-pilot, and heading for a dusty desk job in London HQ. From there he will do a far less rugged-sounding event organisation role - including arranging a sports event for military veterans. It's going to come as a bit of a shock to the system after so long as 'just one of the lads.' But he's not the first famous person to have made an unexpected and fairly dramatic career change. Only 15% of people recently voted this their favourite celebrity career change of all time, but they're missing a trick. The man who as part of D:Ream played keyboards on hits like 'Things Can Only Get Better' could be looking forward to a life on the 'line-up' on 'Never Mind The Buzzcocks', but instead he's such a successful scientist that he got an OBE for it in 2010. He trained as a neurosurgeon and worked as a hospital house officer, but left that all behind to become the face of TV Burp and star in his own movie. He now has a bulging mantlepiece of Baftas and British Comedy Awards. The A-list actress took her first role on stage almost 25 years ago, and remains a stalwart of the screen in everything from Iron Man to The Talented Mr Ripley. However, she has also make a splash in the healthy-eating cookery book market. Her tome, 'It's All Good: Delicious Easy Recipes That Will Make You Look Good and Feel Great' was recently voted one of the cookery books we were most likely to own and not use. Arnold Schwarzenegger was following a well-trodden path when he moved from the world of acting to politics (although it's fairly usual to come back again the other way). The most successful of these transformations was Ronald Reagan who went from starring in movies such as Knute Rockne and Bedtime for Bonzo, to becoming the 40th President of the United States and an enduring conservative icon. He is reportedly taking a break from a multi-award-winning acting career to spend some time with his family on his farm near Dublin. As well as mastering farming he is reportedly learning the art of stonemasonry. This isn't the first time he's opted for a weird sabbatical: last time he chose to become an apprentice to an Italian cobbler. It's hard to decide which has been the more entertaining footballer-to-actor transformation between Cantona and Vinnie Jones, but the Frenchman's decision to retire early at the age of 30 in order to indulge his acting passion gives him the edge. Such is the fame of the George Forman grill you could be forgiven for forgetting that he was ever the oldest Heavyweight Champion in 1994. However, it's not his grilling exploits (which he made famous in 1999) that formed his most unusual career change: it was the decision to give up boxing and become minister of a church in Texas in the mid-1970's. The switch from pop star to designer isn't so unusual nowadays. Most self-respecting singers have their spin off labels. However, what was so unusual was the way Beckham did it. She launched her high end label long after the zenith of her career, and did her best to put her pop days behind her. What has been even more surprising is the enormous success she has made of her second career. She hit the peak of her pop career in the 1980s and has since sold 10 million albums and 20 million singles. Then in 1998, while she was still making music, she decided it was time to start a transition into becoming a landscape gardener. She has since won a gold medal at the Chelsea Flower Show, presented countless gardening programmes and written gardening books. She's another one who escaped the line-up of 'Never Mind The Buzzcocks'. Most people who qualify as a lawyer consider it to be time for their hard work to pay off with a lucrative career. But that wasn't what Bocelli had in mind. After working as a defence lawyer until the age of 34, he took up singing professionally - and the rest is history.